Rags and cloths soaked with solvents, thinners, linseed oil, combustible adhesives and other flammable liquids present a serious fire risk when improperly discarded. 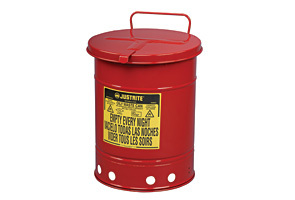 OSHA Compliant Oily Waste Cans are essential whenever solvent soaked cloths and wiping rags are used. The specially designed lid opens no more than 60 degrees and stays closed when not in use, isolating contents from fire sources and limiting oxygen so spontaneous combustion risk is virtually eliminated. Round construction and elevated bottom encourage circulation of air around can to disperse heat and reduce moisture buildup and rusting. Steel waste cans with self-closing lids, like these Oily Waste Cans, are designed in compliance with OSHA 29CFR 1910.125 and have undergone rigorous tests and quality audits to obtain UL listing and FM approvals.